This past Friday, thanks to fellow blogger Ian Phillips and Ambassador at Chelsea Brewing Company, I was able to spend the whole day shadowing and helping head brewer Chris Sheehan and assistant brewer Mark Szmaida. The day began with my arrival to the brewery at 7:30am (which was quite difficult considering what I was doing the night before) and Chris immediately put me to work washing kegs. 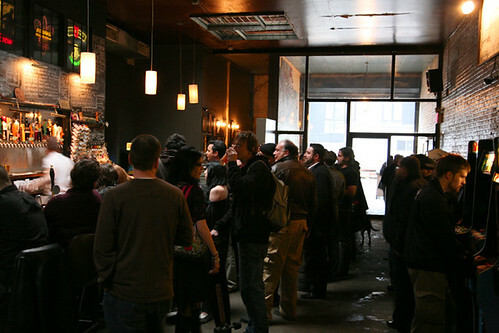 He said it was to be a busy day because they would be brewing AND cleaning and refilling multiple kegs to redistribute to various bars in the area (they had recently numbered all their kegs and they were up to 200). 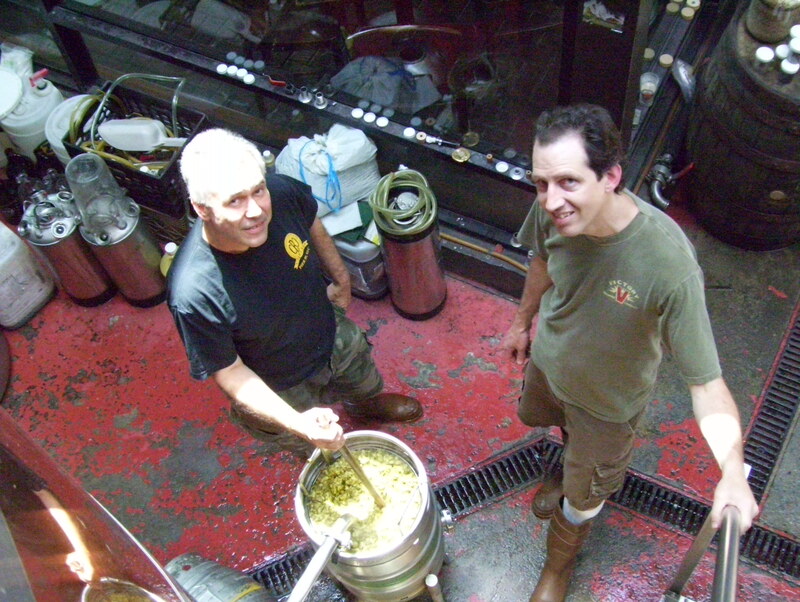 After finishing cleaning about 20-25 kegs, Chris & Mark started the brew. For the most part I just followed them around as they went through the steps of making their flagship beer, Chelsea Checker Cab Blonde Ale, occasionally lending a hand here and there. Imagine my surprise when they asked me to climb INTO the mash tun and clean it out after the mash had been transferred to the hot liquor tank to be brought to a boil. So I got in with a hose and started working my way around clearing out the excess spent grain, thinking to myself, "I'M INSIDE A MASH TUN!". Nerdgasm. Cut to 25 minutes later, and I'm climbing out of the tank soaked with my back killing me. It made me realize that if my dream to become a brewer came true, it would still be hard work. But much more rewarding than anything I've done before (or am doing, don't tell my boss that I wasn't actually sick on Friday). Once I was done with that, the boil had begun, so Mark let me add the 3 lbs of pellet hops. Awesome. Sounds stupid, I know, but it's fun to think I actually had a hand in making beer that will be sold to thirsty costumers at both the brewery and other bars in NYC. In between all of this, they let me do a fair amount of sampling from the taps from behind the bar. Man, to constantly have beer YOU MADE on tap right there every day would be wonderful. I definitely only had a liquid lunch. I finished up by helping with the hopback (seen above - a running of the wort through whole leaf hops and then into the fermenting tank, didn't know that before Friday) and then assisting with the cleanup process. We were done by about 3:30pm, about a 7 hour day. Not bad! Although, I think if I had my own brewery, I'd probably make my hours a little later...I'd have trouble getting up at 6am every morning. Big thanks again to the brewers, Chris & Mark and to Ambassador Ian. It was great to get an idea of what operating a commercial brewery would be like. Hopefully someday I can be as helpful to the curious homebrewing community as they were to me. I went to Liquor Outlet Wine Cellars in Boonton, NJ again and picked up a wide range of stuff for a BBQ. Let's see what we've got here. Wow. The Bruery is a relatively new brewery from Placentia, CA and so far, every single thing I've had of there's has been phenomenal. I'll have a Bruery-specific blog post coming soon. I recently attended a Southern Tier event at The Habitat in Brooklyn and had the chance to meet and talk to a rep for the brewery. I was surprised to learn that their brews actually aren't distributed very far. I guess it's the type of thing where you take for granted great beer when it's readily available everywhere around you. If anyone reading this blog is outside their distribution and wants to set up a trade, let me know. As for the beer itself, it was very good but not quite as good as the amazing Choklat. One of my favorite things about this beer is letting BMC (BudMillerCoors) drinkers take a sip and enjoying their reaction. 9 out of 10 reactions are near shock followed by disgust. Fun stuff. I was definitely one of those people not all that long ago. The thought of a sour beer just sounded awful to me. But I've come around and it's now one of my favorite styles. The Cantillon Kriek is strong on the cherries however, unlike The Bruery Sasion Rue. Hey, look! I'm covering Dogfish Head again! American Strong Ales are new to me, but I've grown to really enjoy them. This one is brewed with peat-smoked barley, organic juniper berries, vanilla & maple syrup and then aged on oak and fermented with a blend of English & Belgian yeasts. I really love the vanilla-on-oak flavors. My biggest complaint is that this seems to be one of the hardest DFH to find in NYC. I had posted previously about how I had hated this beer the first time I tried it. But man, have I pulled a complete 180 on this. I'm obsessed. I've bought a ton of bottles of this in the last two months. It's so good and interesting. Completely unlike the rest of the DFH beers. The only thing I don't quite understand is why BeerAdvocate lists it as a Berliner Weissbier. Can anyone enlighten me on that? An excellent example of a Witbier. Next time you have the choice, pick this up over a Hoegaarden. Hoegaarden is owned by AB-InBev and wouldn't you rather support local Maine craft beer? Whoa, this one's not for everyone. Definitely interesting. Sour cherries meets apple juice. I actually expected this to be more similar to Festina Peche for some reason, but I got more of vegetable notes out of it. Worth trying. Liquor Outlet Wine Cellars in Boonton, NJ. Who would have known from the name (or the outside) of the vast craft beer selection here. This was the one place I was able to score Founder's Kentucky Breakfast Stout from a few months ago, and as you can see from the picture, there's plenty of other beers to choose from. I try to stop by this place at least once a month as they're always getting new stuff in. 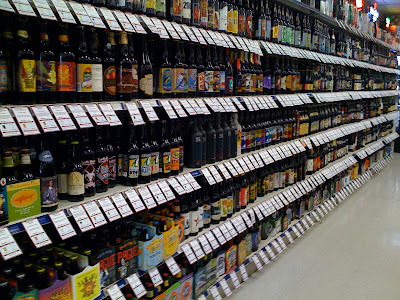 Their staff is friendly and knowledgeable, and their imported craft beer is quite sizable as well. This picture is actually only a sliver of what's available.